Cancer is among the most serious diseases endangering human life and health. At present, traditional Chinese medicine has showed excellent prospects for wide application in tumor treatment. In this study, fourteen novel bisbenzylisoquinoline derivatives were designed and synthesized by Suzuki-Miyaura reaction of 5-bromotetrandrine with a variety of arylboronic acids. The anti-tumor activities of these new compounds on human lung cancer cells (A549) and murine leukemia cells (P388) were evaluated by using the CCK-8 method. Apoptosis and cell cycle were detected by flow cytometry. These compounds exhibited better activities than tetrandrine itself on A549 cells. Among them, compound 1 exhibited the most significant cytotoxic effects. Preliminary mechanistic studies indicated that the ant proliferative efficacy of compound 1 was mediated by its induction of apoptosis and cell cycle arrest at the S and G2 phases. Fourteen new tetrandrine derivatives were synthesized and tested for their anti-tumor activities in vitro. All compounds showed stronger cytotoxic effects than the parent compound tetrandrine in A549 cell lines. These findings will contribute to the future design of more effective anti-tumor agents in lung cancer therapy. Cancer is among the most serious diseases endangering human life and health. At present, most anti-tumor drugs exhibit various undesirable side effects, including immunosuppression [1,2]. Therefore, the quest for new anti-tumor drugs and therapeutic approaches with reduced side effects and improved quality of life for patients has long been a topic of considerable interest in medical research. Because of its abundant resources, low cost and low incidence of side effects, traditional Chinese medicine has excellent prospects for wide application in tumor treatment. It is therefore not surprising that the search for new anti-tumor drugs from natural products and the further optimization of their activity through structural modification has become a well-established strategy in the development of new chemotherapeutic agents. Tetrandrine (Tet), a bisbenzylisoquinoline (BBIQ) alkaloid isolated from the root of Stephania tetrandra S. Moore, has been shown to possess a variety of pharmacological effects, including anti-hypertensive and heart-protective in the cardiovascular system [3,4], anti-silicosis and anti-pulmonary hypertension in the respiratory system [5,6], as well as activities in the digestive [7,8] and immune systems [9,10], etc. The anti-tumor effect of Tet, in particular, has been widely reported [11-14]. Studies have shown that its anti-tumor mechanism involves direct cytotoxicity, induction of apoptosis, reversal of drug resistance, normal tissue radiation protection, anti-distant metastasis and anti-angiogenesis [15,16]. Among these, the induction of apoptosis of Tet has been reported on various tumor cells, including human leukemia cells, lung cancer cells, liver cancer cells, colon cancer cells, lymphoma cells, human breast cancer cells, etc. [17-20]. Recent studies have shown that substitution at the C-5 position of tetrandrine can increase its antitumor activity [21,22]. In this study, tetrandrine was first derivatized at C-5 position by bromination under low temperatures and the resulting 5-bromotetrandrine was used as a common intermediate for the synthesis of a series of new tetrandrine derivatives via the Suzuki-Miyaura cross-coupling reaction. The biological activities of the newly-synthesized tetrandrine derivatives were evaluated using A549 and P388 cells. 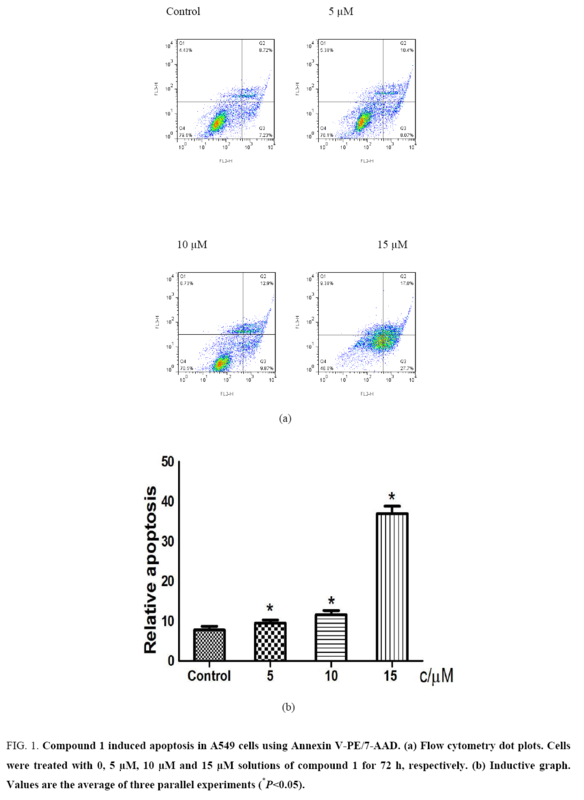 The antitumor mechanism of compound 1 was also investigated preliminarily by flow cytometry. Melting points were determined on a digital display microscopic melting point apparatus (X-4, Beijing Tech Instrument Co., Ltd.). 1H NMR and 13C NMR spectra were recorded on Bruker-400 or Bruker-600 NMR spectrometers with tetramethylsilane (TMS) as internal standard and with CDCl3 or DMSO-d6 as solvent. ESI-MS was performed on a Waters ZQ 2000 instrument. Column chromatography was performed on silica gel (200-300 mesh, Qindao Marine Chemical Factory, China). The progress of reactions was monitored by thin layer chromatography (silica gel GF254, Qindao Marine Chemical Factory, China) with visualization under UV light (ZF-I, Shanghai Chi Tang Electronics Co., Ltd.) at 254 nm. Most reagents were purchased from commercial sources and used without further purification. P388 cells, A549 cells were provided by the Shanghai Institute of Materia Medica, Chinese Academy of Sciences. Tetrandrine (3.00 g, 4.82 mmol) was dissolved in a mixture of trifluoroacetic acid and water (30 mL, 2:1). The resulting mixture was cooled to -15°C and a solution of bromine in acetic acid (5.0 mL, 1.2 mol/L, 6.0 mmol) was added drop wise. The resulting mixture was stirred at -15°C for 4.5 h. The reaction was quenched by the addition of ice water (50 mL), and the pH was adjusted to ca. 10 with aqueous ammonium hydroxide. The resulting mixture was extracted with CH2Cl2 (2 × 100 mL) and the combined organic layers were washed with brine (3 × 30 mL), dried over anhydrous sodium sulfate and concentrated under reduced pressure. The residue was crystallized from anhydrous ether (200 mL) and the crystals were subjected to column chromatography (dichloromethane-methanol, 45:1, v/v) to afford 5-bromotetrandrine (3.15 g, 4.50 mmol, 93%). To a solution of 5-bromotetrandrine (70 mg, 0.10 mmol) in toluene and water (25 mL, 5:1, v/v) was added a solution of sodium carbonate (5 mL, 1 M) and the mixture was degassed ultrasonically at room temperature for 30 min. Under a nitrogen atmosphere, Pd(PPh3)4 (34.6 mg, 0.0300 mmol), TBAB (64.4 mg, 0.200 mmol) and the arylboronic acid derivative (0.200 mmol) were added to the solution. The mixture was heated at 90°C for 24 h, cooled to room temperature and quenched by the addition of ice water (5 mL). The mixture was extracted with ethyl acetate (2 × 15 mL) and the combined organic layers were washed with saturated brine (3 × 30 mL), dried over anhydrous sodium sulfate and concentrated under reduced pressure. Products were isolated by preparative thin layer chromatography eluting with dichloromethane-methanol (20:1, v/v). White powder; 1H NMR (600 MHz, CDCl3) δ 7.34 (dd, J=8.2, 2.2 Hz, 1H), 7.14 (dd, J=8.1, 2.6 Hz, 1H), 6.89 (d, J=8.9 Hz, 1H), 6.87 (s, 1H), 6.80 (dd, J=8.3, 2.6 Hz, 1H), 6.54 (d, J=1.8 Hz, 1H), 6.51 (s, 1H), 6.30 (dd, J=7.3, 3.1 Hz, 2H), 5.99 (s, 1H), 3.93 (s, 3H), 3.88 (dd, J=10.8, 5.5 Hz, 1H), 3.75 (s, 4H), 3.56 – 3.48 (m, 1H), 3.47 – 3.40 (m, 1H), 3.37 (s, 3H), 3.26 (dd, J=12.2, 5.3 Hz, 1H), 3.18 (s, 3H), 2.98 – 2.85 (m, 4H), 2.82 – 2.77 (m, 1H), 2.76 – 2.68 (m, 2H), 2.62 (s, 3H), 2.52 (d, J=14.0 Hz, 1H), 2.47 – 2.40 (m, 2H), 2.34 (s, 3H). 13C NMR (101 MHz, CDCl3) δ: 153.32, 150.95, 148.92, 148.16, 148.04, 146.60, 143.35, 137.41, 134.83, 134.57, 132.28, 129.75, 127.67, 127.66, 127.55, 122.49, 122.38, 121.52, 121.46, 119.76, 115.83, 112.25, 111.12, 105.33, 63.44, 61.00, 59.82, 55.68, 55.37, 55.32, 44.85, 43.68, 42.24, 41.88, 41.58, 37.68, 24.91, 21.54. ESI-MS m/z: 623.5 [M+H]+, calculated value (C38H42N2O6): m/z: 622.3. White powder; Yield: 93%; m.p. 141.8-143.5°C (Lit. 142.3-144.1°C); 1H NMR (600 MHz, CDCl3) δ 7.36 (dd, J=8.1, 1.6 Hz, 1H), 7.16 (dd, J=8.1, 2.2 Hz, 1H), 6.87 (d, J=6.5 Hz, 2H), 6.80 (dd, J=8.3, 2.4 Hz, 1H), 6.54 (s, 1H), 6.51 (s, 1H), 6.30 (dd, J=8.3, 1.9 Hz, 1H), 6.04 (s, 1H), 3.93 (s, 3H), 3.79 (dd, J=13.1, 4.9 Hz, 1H), 3.74 (s, 3H), 3.54 (d, J=11.0 Hz, 2H), 3.39 (s, 4H), 3.23 (s, 1H), 3.21 (s, 3H), 3.01 (s, 4H), 2.82 (t, J=11.8 Hz, 2H), 2.71 (s, 5H), 2.48 (d, J=12.6 Hz, 1H), 2.31 (s, 3H). 13C NMR (101 MHz CDCl3) δ 153.71, 149.25, 148.65, 148.23, 147.71, 147.04, 143.27, 142.72, 134.83, 134.25, 132.56, 130.05, 128.02, 127.99, 127.87, 127.72, 122.75, 121.92, 121.88, 120.24, 116.08, 112.57, 112.10, 111.41, 63.67, 61.49, 60.40, 60.29, 56.03, 55.37, 45.05, 43.61, 42.48, 42.02, 41.32, 37.73, 25.17, 22.60; ESI-MS m/z: 701.3 [M+H]+, calculated value (C38H41BrN2O6): m/z: 700.4. Yellow powder; Yield: 88%; m.p. 197.5-199.3°C; 1H NMR (400 MHz, CDCl3) δ 8.89 – 8.70 (m, 1H), 8.15 (d, J=8.4 Hz, 1H), 8.11 – 7.98 (m, 1H), 7.84 (d, J=8.0 Hz, 1H), 7.77 – 7.70 (m, 1H), 7.57 (t, J=7.5 Hz, 1H), 7.38 (dd, J=8.2, 2.0 Hz, 1H), 7.17 (dd, J=8.2, 2.5 Hz, 1H), 6.96 – 6.81 (m, 3H), 6.58 (s, 2H), 6.35 (d, J=7.1 Hz, 1H), 6.07 (s, 1H), 3.99 – 3.95 (m, 1H), 3.93 (s, 3H), 3.91 – 3.86 (m, 1H), 3.48 (s, 3H), 3.46 (s, 3H), 3.44 – 3.37 (m, 2H), 3.33 (dd, J=12.0, 5.5 Hz, 1H), 3.27 (s, 3H), 3.10 – 2.89 (m, 3H), 2.87 – 2.73 (m, 4H), 2.67 (s, 3H), 2.67 – 2.59 (m, 2H), 2.33 (s, 3H). 13C NMR (101 MHz, CDCl3) δ 153.86, 152.34, 149.73, 149.55, 148.57, 148.49, 147.24, 147.02, 143.68, 142.07, 136.70, 135.17, 134.62, 132.74, 130.31, 130.19, 129.44, 129.29, 128.32, 128.13, 127.97, 126.81, 126.64, 125.67, 122.96, 122.16, 122.12, 120.47, 120.28, 116.11, 112.66, 111.61, 105.85, 63.92, 61.89, 61.58, 60.85, 60.38, 56.23, 55.86, 50.77, 45.21, 42.64, 37.91, 29.80, 25.38, 21.80. ESI-MS m/z: 750.5 [M+H]+, calculated value (C47H47N3O6): m/z: 749.6. White powder; Yield: 92%; m.p. 189.7-191.3°C; 1H NMR (600 MHz, CDCl3) δ 8.75 – 8.64 (m, 1H), 7.45 – 7.40 (m, 2H), 7.38 (dd, J=8.2, 1.8 Hz, 1H), 7.22 (s, 1H), 7.14 (dd, J=8.2, 2.4 Hz, 1H), 7.03 (d, J=8.2 Hz, 1H), 6.95 (d, J=8.2 Hz, 1H), 6.90 (d, J=8.2 Hz, 1H), 6.83 (dd, J=8.3, 2.4 Hz, 1H), 6.59 (s, 1H), 6.57 (s, 1H), 6.55 – 6.50 (m, 1H), 6.33 (dd, J=8.3, 2.0 Hz, 1H), 6.07 (s, 1H), 3.92 (s, 4H), 3.61 (dd, J=15.8, 10.7 Hz, 2H), 3.47 (s, 3H), 3.46 (s, 1H), 3.39 (s, 3H), 3.24 (s, 3H), 3.14 – 3.02 (m, 4H), 2.91 (dd, J=14.8, 5.8 Hz, 1H), 2.85 (d, J=11.8 Hz, 1H), 2.83 – 2.76 (m, 3H), 2.74 (s, 3H), 2.59 (s, 1H), 2.46 (s, 3H). 13C NMR (101 MHz, CDCl3) δ 153.80, 150.30, 149.46, 148.91, 147.72, 146.55, 143.88, 142.18, 135.04, 133.74, 132.52, 131.21, 130.38, 127.86, 127.77, 126.82, 124.78, 124.74, 123.89, 123.74, 123.66, 122.06, 122.00, 121.78, 121.54, 120.47, 115.38, 112.46, 111.71, 111.03, 110.89, 102.19, 63.79, 60.64, 60.25, 56.00, 55.70, 44.83, 43.46, 41.86, 41.68, 37.96, 29.62, 29.28, 24.25, 22.78. ESI-MS m/z: 728.4 [M+H]+, calculated value (C46H47N3O6): m/z: 727.6. Gray powder; yield: 65%; m.p. 147.6-149.5°C; 1H NMR (600 MHz, CDCl3) δ 9.27 (s, 1H), 8.30 (s, 1H), 8.04 (d, J=8.1 Hz, 1H), 7.68 (t, J=7.3 Hz, 1H), 7.63 (t, J=7.3 Hz, 1H), 7.48 (d, J=8.3 Hz, 1H), 7.44 (dd, J=8.4, 1.9 Hz, 1H), 7.19 (dd, J=8.2, 2.4 Hz, 1H), 7.13 (dd, J=8.2, 2.2 Hz, 1H), 6.90 (d, J=8.1 Hz, 1H), 6.86 (dd, J=8.3, 2.4 Hz, 1H), 6.64 (s, 1H), 6.54 (s, 1H), 6.38 – 6.35 (m, 1H), 6.10 (s, 1H), 3.93 (s, 3H), 3.92 (s, 1H), 3.76 (s, 2H), 3.54 (s, 3H), 3.45 (s, 1H), 3.35 (s, 3H), 3.29 (s, 3H), 3.19 (s, 1H), 3.09 – 2.99 (m, 4H), 2.88 (t, J=12.0 Hz, 2H), 2.85 (s, 4H), 2.82 (s, 1H), 2.54 (s, 1H), 2.42 (s, 3H). 13C NMR (101 MHz, CDCl3) δ 154.42, 154.41, 152.35, 149.72, 149.43, 147.88, 147.56, 144.01, 143.34, 142.40, 135.10, 132.60, 132.50, 132.09, 131.93, 131.22, 130.57, 130.52, 129.85, 128.53, 128.35, 128.09, 127.54, 124.24, 124.17, 122.41, 122.33, 120.37, 120.26, 116.58, 112.21, 112.16, 111.85, 64.16, 60.98, 60.41, 60.35, 56.04, 55.86, 55.76, 44.64, 43.28, 41.22, 41.06, 29.66, 27.17, 22.65. ESI-MS m/z: 750.3 [M+H]+, calculated value (C47H47N3O6): m/z: 749.6. Yellow powder; yield: 65%; m.p. 131.4-132.9°C; 1H NMR (600 MHz, CDCl3) δ 9.30 (s, 1H), 8.46 (d, J=5.6 Hz, 1H), 7.99 (d, J=8.1 Hz, 1H), 7.66 (t, J=7.6 Hz, 1H), 7.49 (d, J=6.8 Hz, 1H), 7.41 (d, J=8.0 Hz, 1H), 7.29 (d, J=5.7 Hz, 1H), 7.17 (d, J=8.0 Hz, 1H), 6.95 (d, J=2.9 Hz, 1H), 6.88 – 6.83 (m, 2H), 6.61 (s, 1H), 6.57 (s, 1H), 6.35 (d, J=7.9 Hz, 1H), 6.09 (s, 1H), 3.93 (s, 3H), 3.64 (s, 1H), 3.50 (s, 3H), 3.37 – 3.33 (m, 3H), 3.31 (s, 3H), 3.27 (s, 3H), 3.12 – 3.05 (m, 2H), 2.97 – 2.82 (m, 4H), 2.76-2.70 (m, 6H), 2.45 (s, 1H), 2.35 (s, 3H). 13C NMR (101 MHz, CDCl3) δ 154.05, 152.80, 149.87, 149.32, 148.99, 147.88, 147.32, 143.87, 143.37, 141.99, 135.03, 133.84, 133.63, 133.62, 132.56, 131.73, 130.28, 129.84, 129.82, 128.76, 127.32, 127.20, 126.84, 126.76, 126.74, 125.85, 123.10, 122.11, 120.26, 118.14, 115.85, 112.37, 111.57, 63.92, 61.79, 60.74, 60.22, 56.04, 55.64, 44.86, 42.58, 41.87, 38.08, 29.62, 27.14, 24.06, 22.61. ESI-MS m/z: 750.4 [M+H]+, calculated value (C47H47N3O6): m/z: 749.6. Dark gray powder; yield: 64%; m.p. 203.4-204.5°C; 1H NMR (600 MHz, CDCl3) δ 7.87 (d, J=3.5 Hz, 2H), 7.49 – 7.33 (m, 4H), 7.16 (d, J=6.8 Hz, 2H), 6.89 (d, J=8.1 Hz, 2H), 6.84 (d, J=7.2 Hz, 1H), 6.59 (s, 1H), 6.55 (s, 1H), 6.34 (d, J=7.8 Hz, 1H), 6.07 (s, 1H), 3.94 (s, 3H), 3.75 (s, 1H), 3.61 (s, 1H), 3.47 (s, 3H), 3.43 (s, 3H), 3.25 (s, 3H), 3.07 (d, J=6.6 Hz, 3H), 2.93 (s, 2H), 2.87 – 2.80 (m, 2H), 2.75 (s, 5H), 2.70 – 2.65 (m, 1H), 2.51 (s, 2H), 2.39 (s, 3H). 13C NMR (101 MHz, CDCl3) δ 169.12, 153.92, 150.88, 149.38, 148.94, 144.72, 143.73, 142.45, 142.01, 132.65, 132.54, 132.08, 130.87, 130.39, 130.24, 130.12, 128.77, 127.34, 123.39, 123.21, 122.80, 122.66, 122.17, 122.13, 120.62, 120.26, 119.68, 115.70, 112.25, 112.08, 111.58, 63.84, 60.72, 60.45, 60.24, 56.00, 55.63, 55.54, 44.75, 41.94, 41.67, 36.49, 29.62, 27.12, 22.61. ESI-MS m/z: 742.4 [M+H]+, calculated value (C45H47N3O7): m/z: 741.6. White powder; yield: 67%; m.p. 197.5-199.0°C; 1H NMR (600 MHz, CDCl3) δ 8.88 (d, J=2.7 Hz, 1H), 8.22 (dd, J=8.2, 1.1 Hz, 1H), 7.87 (d, J=8.0 Hz, 1H), 7.59 (t, J=7.6 Hz, 1H), 7.48 (d, J=6.8 Hz, 1H), 7.42 (dd, J=8.2, 4.1 Hz, 2H), 7.17 (d, J=6.8 Hz, 2H), 6.91 (d, J=8.1 Hz, 1H), 6.85 (d, J=7.2 Hz, 1H), 6.63 (s, 1H), 6.58 (s, 1H), 6.34 (d, J=7.9 Hz, 1H), 6.09 (s, 1H), 3.93 (s, 3H), 3.79 – 3.65 (m, 3H), 3.54 (s, 3H), 3.50 (s, 1H), 3.38 – 3.34 (m, 1H), 3.32 (s, 3H), 3.26 (s, 3H), 3.23 – 3.07 (m, 4H), 3.06 – 2.93 (m, 3H), 2.90 – 2.85 (m, 2H), 2.83 (s, 3H), 2.51 (s, 3H). 13C NMR (101 MHz, CDCl3) δ 154.12, 150.54, 150.47, 149.39, 149.34, 147.90, 147.25, 146.52, 144.16, 142.20, 136.46, 135.47, 132.77, 132.48, 131.72, 131.43, 130.43, 128.56, 128.11, 128.09, 126.25, 126.18, 126.16, 123.82, 123.80, 122.44, 122.13, 122.07, 121.18, 120.60, 115.49, 112.35, 111.74, 63.88, 60.53, 60.16, 58.95, 56.02, 55.70, 44.79, 42.81, 41.52, 38.24, 29.61, 29.23, 24.07, 23.57. ESI-MS m/z: 750.3 [M+H]+, calculated value (C47H47N3O6): m/z: 749.6. Gray powder; yield: 62%; m.p. 151.5-152.9°C; 1H NMR (600 MHz, CDCl3) δ 7.38 (d, J=7.5 Hz, 1H), 7.14 (d, J=6.9 Hz, 1H), 7.08 (s, 1H), 6.88 (d, J=7.8 Hz, 1H), 6.82 (d, J=7.1 Hz, 1H), 6.73 (s, 1H), 6.69 (d, J=2.6 Hz, 1H), 6.57 (s, 1H), 6.53 (s, 1H), 6.33 (d, J=7.6 Hz, 1H), 6.04 (s, 1H), 3.93 (s, 3H), 3.73 (s, 1H), 3.56 (s, 3H), 3.44 (s, 3H), 3.39 (s, 1H), 3.34 – 3.29 (m, 1H), 3.21 (s, 3H), 3.11 – 2.98 (m, 3H), 2.94 – 2.77 (m, 5H), 2.72 (s, 4H), 2.65 (s, 1H), 2.62 (s, 1H), 2.50 (s, 3H), 2.37 (s, 3H). 13C NMR (101 MHz, CDCl3) δ 153.97, 149.41, 148.99, 147.70, 147.51, 143.79, 141.97, 140.28, 133.63, 132.53, 130.35, 128.53, 128.41, 128.31, 127.74, 126.85, 124.98, 123.43, 123.41, 123.40, 122.45, 122.16, 122.09, 120.38, 115.60, 112.28, 111.65, 111.57, 63.89, 61.03, 60.16, 58.96, 56.05, 55.65, 44.81, 43.15, 41.83, 41.77, 38.15, 29.65, 24.09, 22.64, 15.26. ESI-MS m/z: 719.4 [M+H]+, calculated value (C43H46N2O6S): m/z: 718.6. Light yellow powder; yield: 90%; m.p. 144.3-145.8°C; 1H NMR (400 MHz, DMSO) δ 7.48 (d, J=7.9 Hz, 1H), 7.10 (dd, J=8.1, 1.7 Hz, 1H), 6.91 (d, J=8.2 Hz, 1H), 6.79 – 6.70 (m, 2H), 6.68 (s, 1H), 6.50 (s, 1H), 6.38 (s, 3H), 5.95 (s, 1H), 3.81 (s, 3H), 3.76 (s, 6H), 3.69 (s, 3H), 3.62 (d, J=11.9 Hz, 1H), 3.46 (s, 3H), 3.38 (s, 3H), 3.36-3.26 (m, 4H), 3.20 (dd, J=12.2, 5.2 Hz, 1H), 3.14 (s, 3H), 2.95 – 2.63 (m, 7H), 2.53 (s, 3H), 2.37 (d, J=13.2 Hz, 1H), 2.15 (s, 3H). 13C NMR (101 MHz, DMSO) δ 152.89, 152.55, 149.00, 148.70, 147.83, 147.81, 147.04, 146.65, 142.83, 141.36, 136.26, 135.62, 134.06, 132.57, 132.20, 130.58, 130.57, 129.27, 128.20, 126.91, 125.38, 122.98, 121.61, 121.36, 119.26, 115.11, 113.10, 111.97, 107.12, 105.88, 62.81, 61.43, 60.57, 60.00, 59.79, 56.02, 55.97, 55.90, 55.66, 44.71, 43.72, 42.30, 42.18, 41.62, 36.43, 25.01, 20.47. ESI-MS m/z: 789.6 [M+H]+, calculated value (C47H52N2O9): m/z: 788.4. Yellow powder; yield: 57%; m.p. 139.4-140.9°C; 1H NMR (400 MHz, CDCl3) δ 8.58 (s, 1H), 7.87 (d, J=6.6 Hz, 1H), 7.83 – 7.69 (m, 2H), 7.66 (s, 1H), 7.56 (s, 1H), 7.40 – 7.32 (m, 1H), 7.22 (s, 1H), 6.99 (d, J=8.2 Hz, 1H), 6.95 (s, 1H), 6.73 (t, J=8.6 Hz, 1H), 6.44 (d, J=10.8 Hz, 1H), 4.32 (s, 6H), 4.24 (s, 3H), 3.87 (s, 3H), 3.79 (d, J=10.1 Hz, 3H), 3.69 (s, 3H), 3.62 (s, 1H), 3.45 – 3.26 (m, 3H), 3.25 – 3.11 (m, 5H), 3.05 (s, 5H), 2.70 (s, 3H). 13C NMR (101 MHz, CDCl3) δ 160.51, 152.78, 148.60, 148.35, 147.39, 146.10, 145.95, 144.89, 142.94, 140.78, 139.20, 138.73, 135.52, 133.97, 131.64, 129.15, 128.29, 125.67, 124.55, 123.26, 121.84, 120.91, 118.87, 115.64, 114.98, 112.18, 111.61, 111.53, 110.49, 62.85, 59.72, 59.58, 59.38, 59.24, 59.06, 55.10, 54.74, 54.63, 52.31, 44.14, 41.56, 36.88, 28.68, 24.26. ESI-MS m/z: 730.6 [M+H]+, calculated value (C44H47N3O7): m/z: 729.3. Light yellow powder; yield: 88%; m.p. 134.2-135.8°C; 1H NMR (400 MHz, DMSO) δ 7.48 (d, J=8.1 Hz, 1H), 7.10 (dd, J=7.9, 1.5 Hz, 1H), 6.91 (d, J=8.2 Hz, 1H), 6.77 – 6.69 (m, 2H), 6.66 (s, 1H), 6.47 (s, 1H), 6.37 (d, J=8.5 Hz, 3H), 6.22 (s, 1H), 5.94 (s, 1H), 3.81 (s, 3H), 3.74 (s, 6H), 3.72 (d, J=3.0 Hz, 1H), 3.60 (d, J=9.9 Hz, 1H), 3.42 (s, 3H), 3.35 (s, 4H), 3.32 (s, 2H), 3.23 – 3.17 (m, 1H), 3.16 (s, 3H), 2.93 – 2.64 (m, 7H), 2.53 (s, 3H), 2.37 (d, J=13.4 Hz, 1H), 2.13 (s, 3H). 13C NMR (101 MHz, DMSO) δ 160.22, 160.08, 155.38, 152.90, 148.99, 148.51, 147.71, 147.20, 146.67, 143.48, 142.86, 141.42, 138.70, 135.63, 134.07, 132.61, 130.58, 129.24, 128.20, 126.57, 125.49, 123.01, 121.63, 121.38, 119.21, 115.10, 113.11, 111.92, 107.43, 98.62, 62.77, 61.44, 60.57, 59.85, 55.78, 55.64, 55.17, 54.92, 44.69, 43.50, 42.21, 42.15, 41.56, 36.33, 25.09, 20.20. ESI-MS m/z: 759.5 [M+H]+, calculated value (C46H50N2O8): m/z: 758.4. White powder; yield: 92%; m.p. 186.4-188.1°C; 1H NMR (400 MHz, DMSO) δ 7.83 (d, J=8.0 Hz, 2H), 7.62 (s, 1H), 7.48 (d, J=8.2 Hz, 1H), 7.34 (s, 1H), 7.24 (d, J=8.2 Hz, 1H), 7.16 (d, J=8.8 Hz, 1H), 7.11 (d, J=8.1 Hz, 1H), 6.91 (d, J=8.1 Hz, 1H), 6.77 – 6.71 (m, 2H), 6.68 (s, 1H), 6.41 (s, 1H), 6.37 (d, J=8.4 Hz, 1H), 5.97 (s, 1H), 3.89 (s, 3H), 3.81 (s, 3H), 3.63 (d, J=9.9 Hz, 1H), 3.38 (d, J=5.3 Hz, 3H), 3.34 (s, 7H), 3.18 (s, 4H), 2.93 – 2.62 (m, 7H), 2.53 (s, 3H), 2.41 (d, J=13.4 Hz, 1H), 2.15 (s, 3H). 13C NMR (101 MHz, DMSO) δ 157.27, 152.92, 149.00, 147.74, 147.25, 146.68, 142.92, 141.51, 135.64, 134.08, 133.13, 132.62, 131.62, 130.58, 129.29, 129.22, 128.81, 128.64, 128.39, 128.18, 128.10, 126.88, 126.24, 125.58, 123.15, 123.01, 121.62, 121.36, 119.26, 118.54, 115.16, 113.10, 111.94, 105.76, 62.77, 61.49, 60.34, 59.90, 55.80, 55.64, 55.21, 54.91, 44.70, 42.20, 42.10, 41.62, 36.37, 25.10, 20.58. ESI-MS m/z: 779.5 [M+H]+, calculated value (C49H50N2O7): m/z: 778.4. Gray green powder; yield: 65%; m.p. 139.3-141.2°C; 1H NMR (400 MHz, DMSO) δ 7.48 (d, J=7.9 Hz, 1H), 7.10 (d, J=5.4 Hz, 1H), 6.91 (d, J=8.1 Hz, 2H), 6.86 (s, 1H), 6.82 – 6.68 (m, 3H), 6.65 (s, 1H), 6.41 – 6.34 (m, 2H), 5.94 (d, J=6.8 Hz, 1H), 3.80 (s, 4H), 3.76 (s, 3H), 3.59 (d, J=9.8 Hz, 1H), 3.34 (s, 6H), 3.30 (s, 3H), 3.29 (s, 2H), 3.19 (s, 3H), 3.17 (s, 1H), 2.94 – 2.82 (m, 2H), 2.81 – 2.63 (m, 6H), 2.52 (s, 3H), 2.40 (d, J=13.6 Hz, 1H), 2.12 (s, 3H). 13C NMR (101 MHz, DMSO) δ 158.64, 153.29, 149.41, 149.02, 148.10, 147.72, 147.40, 147.06, 143.25, 142.00, 141.92, 137.67, 136.14, 134.46, 133.01, 130.98, 128.95, 128.48, 127.30, 126.15, 125.97, 123.37, 122.02, 121.78, 119.37, 115.50, 115.38, 113.55, 112.35, 111.44, 63.25, 61.82, 60.48, 60.26, 56.17, 56.05, 55.33, 55.28, 45.13, 42.67, 42.45, 42.28, 36.67, 29.43, 25.58, 20.34. ESI-MS m/z: 743.6 [M+H]+, calculated value (C46H50N2O7): m/z: 742.4. Light yellow powder; yield: 93%; m.p. 157.1-158.5°C; 1H NMR (400 MHz, DMSO) δ 7.47 (dd, J=8.3, 2.1 Hz, 1H), 7.28 (d, J=8.8 Hz, 2H), 7.15 (br s, 1H), 7.11 (br s, 1H), 7.10 (dd, J=8.2, 2.6 Hz, 1H), 6.91 (d, J=8.3 Hz, 1H), 6.75 (dd, J=8.2, 1.8 Hz, 1H), 6.71 (dd, J=8.3, 2.6 Hz, 1H), 6.66 (s, 1H), 6.39 (d, J=1.8 Hz, 1H), 6.36 (dd, J=8.3, 2.1 Hz, 1H), 5.95 (s, 1H), 3.81 (s, 3H), 3.61 (d, J=10.4 Hz, 1H), 3.36 (s, 3H), 3.34 (s, 3H), 3.33 – 3.26 (m, 4H), 3.22 – 3.18 (m, 1H), 3.16 (s, 3H), 2.93 – 2.63 (m, 7H), 2.53 (s, 3H), 2.50 (s, 3H), 2.38 (d, J=13.2 Hz, 1H), 2.13 (s, 3H). 13C NMR (101 MHz, DMSO) δ 152.90, 148.97, 148.70, 147.68, 147.25, 146.67, 142.87, 141.45, 136.37, 135.58, 134.05, 132.96, 132.58, 130.54, 130.37, 128.61, 128.21, 128.15, 126.70, 125.60, 125.43, 122.97, 121.57, 121.37, 121.31, 119.26, 119.21, 115.14, 113.09, 111.96, 62.76, 61.44, 60.32, 59.84, 55.73, 55.65, 44.70, 43.54, 42.18, 42.10, 41.57, 36.34, 25.06, 20.53, 14.55. ESI-MS m/z: 745.6 [M+H]+, calculated value (C45H48N2O6S): m/z: 744.3. Yellowish brown powder; yield: 89%; m.p. 223.4-224.9°C; 1H NMR (400 MHz, DMSO) δ 7.92 (d, J=3.8 Hz, 1H), 7.47 (dd, J=8.3, 2.0 Hz, 1H), 7.12 (d, J=3.8 Hz, 1H), 7.10 (dd, J=8.2, 2.6 Hz, 1H), 6.92 (d, J=8.3 Hz, 1H), 6.76 (dd, J=8.2, 1.8 Hz, 1H), 6.72 (dd, J=8.3, 2.6 Hz, 1H), 6.67 (s, 1H), 6.37 (dd, J=8.3, 2.0 Hz, 2H), 5.95 (s, 1H), 3.81 (s, 3H), 3.60 (d, J=10.2 Hz, 1H), 3.49 (s, 3H), 3.35 (s, 3H), 3.34 – 3.25 (m, 4H), 3.19 (dd, J=11.1, 4.1 Hz, 1H), 3.15 (s, 3H), 2.93 – 2.67 (m, 7H), 2.55 (s, 3H), 2.52 (s, 3H), 2.36 (d, J=13.2 Hz, 1H), 2.14 (s, 3H). 13C NMR (101 MHz, DMSO) δ 190.55, 152.88, 149.60, 149.00, 148.65, 147.61, 146.69, 145.34, 143.90, 142.47, 141.49, 135.66, 133.86, 133.71, 132.57, 130.56, 129.70, 128.73, 128.55, 128.07, 125.94, 122.98, 121.61, 121.34, 120.21, 119.17, 115.08, 112.89, 111.98, 62.80, 61.33, 60.87, 59.95, 55.70, 55.64, 44.67, 43.34, 42.20, 42.11, 41.40, 36.42, 26.43, 25.09, 20.31. ESI-MS m/z: 747.5 [M+H]+, calculated value (C44H46N2O7S): m/z: 746.3. CCK-8 assays were conducted to test the inhibitory activity of the fourteen new tetrandrine derivatives on A549 and P388 cell lines. The A549 and P388 cells were cultured in DMEM culture medium (HyClone, USA) supplemented with 10% fetal bovine serum (Gibco, USA), 100 U/mL penicillin and 80 μg/mL streptomycin. The cells were harvested during the logarithmic growth phase and seeded in 6-well plates at a density of 4.0 × 104 cells/mL. After the cell density reached 80%, compound 1 was added to each well with series concentrations (0, 5, 10 and 15 μmol/L) and cultured in a fully humidified atmosphere at 37°C with 5% CO2 for 72 h. After incubation, the cells were washed in PBS and then the resuspended cells were added in Binding buffer (1x, 100 μL), AnnexinV-PE (5 μL) and 7-AAD (10 μL). The plates were incubated in the dark at room temperature and detected by flow cytometry within 2 h.
Cells were harvested during the logarithmic growth phase and seeded in 6-well plates at a density of 4.0 × 104 cells/mL. After the cell density had increased to 80%, compound 1 (0 and 10 μmol/L) was added to each well and cultured in a fully humidified atmosphere at 37°C with 5% CO2 for 72 h. After incubation, the cells were washed in PBS and fixed in iced 75% ethanol overnight, then washed in PBS to remove the ethanol. To the resuspended cells was added RNAse (2.5 μL, 10 mg/mL) and the mixture was incubated at 37°C in the dark for 30 min, then stained with PI and examined by flow cytometry within 2 h.
Multigroup comparisons of the means were carried out by one-way analysis of variance (ANOVA) test with post hoc contrasts by Student–Newman–Keuls test. The statistical significance for all tests was set at P<0.05. Fourteen new tetrandrine derivatives, which to the best of our knowledge, have not been reported in the literature, were synthesized using the Suzuki-Miyaura cross-coupling reaction (Scheme 1). The new compounds were characterized by MS, 1H NMR and 13C NMR spectroscopy. Scheme 1: Synthesis of novel tetrandrine derivatives 1-14. Anti-tumor activities by CCK-8 method: The anti-tumor activities of the tetrandrine derivatives were evaluated on P388 and A549 cell lines by CCK-8 assay using tetrandrine as a positive control. The results are summarized in Table 1.
aFrom CCK-8 assay after 72 h of treatment and the values are the average of three parallel experiments. Table 1: Yield and IC50 values of 1-14 against the growth of P388 and A549 cell lines. All compounds (including tetrandrine) exhibited potent anti-tumor activity (IC50<10 μM) against P388 cells, and the antitumor activities of compounds 1, 6 and 7 are significantly higher than that of the lead compound tetrandrine. Among these compounds, quinoline derivatives 1 and 6 have better biological activity than isoquinoline derivatives 3 and 4, suggesting the importance for the location of the nitrogen atom. Of the three sulfur-containing compounds (7, 13 and 14), only thiophene derivative 7 exhibited enhanced activity. With regard to activity against the A549 cells, compounds 1-14 were all found to be more active than tetrandrine. As in the case of the P388 cells, quinoline derivative 1 (IC50=2.07 μM) is among the most active against the A549 cells. Isoquinoline derivative 3 (IC50=2.07 μM) exhibited similarly high activity to that of 1 and is significantly more active than its regioisomer 4 (IC50=13.74 μM). The indole derivative 2 (IC50=2.95 μM) also demonstrated impressive activity against the A549 cells. Unlike their activity against the P388 cells, all three sulfur-containing compounds (7, 13 and 14) were found to be significantly more active than tetrandrine against A549 cells. Compound 1 induces apoptosis in A549 cells: To further understand the mechanism of anti-tumor action of compound 1, the Annexin V-PE/7-AAD apoptosis detection kit was used to determine whether compound 1 inhibited tumor cell growth and proliferation by inducing apoptosis or necrosis. As shown in Figure 1, Compound 1 exhibited an obvious effect on the induction of apoptosis to A549 cells and exhibited concentration dependence to some degree. Propidium iodide (PI) staining was used to determine the effect of compound 1 on apoptosis of A549 cells. As shown in Figure 2, when A549 cells were treated with a 10 μM solution of compound 1, the content of the G1 phase of the cell cycle was reduced from 53.2% to 44.9%, but the content of the S (20.8% vs. 23.9%) and G2 (26.0% vs. 31.2%) phases of the cell cycle was elevated significantly, which demonstrated that compound 1 had a certain effect on cell cycle arrest of A549 cells at the period of S and G2 phases. Figure 1: Compound 1 induced apoptosis in A549 cells using Annexin V-PE/7-AAD. (a) Flow cytometry dot plots. Cells were treated with 0, 5 μM, 10 μM and 15 μM solutions of compound 1 for 72 h, respectively. (b) Inductive graph. Values are the average of three parallel experiments (*P<0.05). Figure 2: Compound 1 affects the cell cycle in A549 cells using PI. (a) DNA content histogram of A549 cells. Cells were treated with 0 and 10 μM solutions of compound 1 for 72 h, respectively. (b) The cell cycle distribution of G1, S and G2/M phases. Values are the average of three parallel experiments (*P<0.05). In summary, fourteen new tetrandrine derivatives were synthesized and tested for their anti-tumor activities in vitro. The anti-tumor activities of these compounds against P388 and A549 cell lines were determined by using CCK-8 assays. All compounds showed stronger cytotoxic effects than the parent compound tetrandrine in A549 cell lines. Compared to tetrandrine, compounds 1 and 3 exhibited a greater than 10-fold enhancement in anti-proliferative activity for A549 cells with IC50 values at about 2 μM. 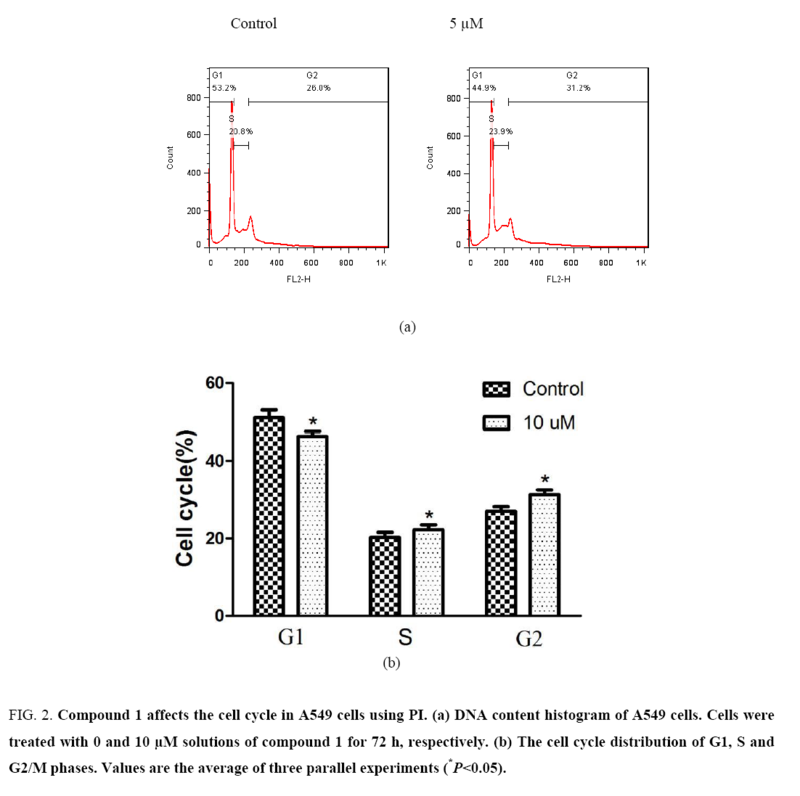 In addition, the results of this work showed that compound 1 induced the apoptosis of A549 cells by blocking the cell cycle in a concentration-dependent manner, and the period is the S and G2 phases. Although there is still insufficient evidence to discuss the structure-activity relationship of the compounds at this time, further structural modification and active screening of the preferred compounds may shed new light on the structure-activity relationship of anti-tumor activity of tetrandrine derivatives. It is therefore necessary to further explore the anti-tumor activity mechanisms of the preferred compounds at the molecular and gene levels. This study was financially supported by the National Natural Science Foundation of China (NO.31700306). Ewer MS, O'shaughnessy JA. Cardiac toxicity of trastuzumab-related regimens in HER2-overexpressing breast cancer. Clinical Breast Cancer. 2007;7(8):22-9. Yang M, Tang ZQ. Prevention and treatments for adverse drug reactions of antitumor drugs. Chin J New Drugs. 2008; 17(21):1889-93. Qian JQ. Cardiovascular pharmacological effects of bisbenzylisoquinoline alkaloid derivatives. ActaPharmacol. Sin. 2002;23(12):1086-92. Xu M, Sheng LH,Zhu XH,et al.Protective effect of tetrandrine on doxorubicin-induced cardiotoxicity in rats. Tumori. 2010; 96(3):460-64. Xie QM, Tang HF. Pharmacological actions of tetrandrine in inflammatory pulmonary diseases. ActaPharmacol Sin. 2002; 23(12):1107-13. Wang HL, Kilfeather SA. Effects of tetrandrine on growth factor-induced DNA synthesis and proliferative response of rat pulmonary artery smooth muscle cells. PulPharmacolTher. 2000; 13(2):53-60. Chen Y,Wu JM,Lin TY,et al. Tetrandrine ameliorated reperfusion injury of small bowel transplantation. J Pediatr Surg. 2009; 44(11):2145-52. Wang ZR, Li DG, Lu HM. Advances on the pharmacologic mechanism and the exploratory development of tetrandrine in diseases of digestive system. Chin JGastroenterolHepatol. 2001; 10(3):281-84. Dong Y, Yang MM, Kwan CY. In vitro inhibition of proliferation of HL-60 cells by tetrandrine and coriolusversicolor peptide derived from Chinese medicinal herbs. Life Sci. 1997;60(8): 135-40. Jang BC, Lim KJ, Paik JH, et al. Tetrandrine-induced apoptosis is mediated by activation of caspases and PKC-delta in U937 cells. BiochemPharmacol. 2004;67(10):1819-29. Lan JJ, Wang N, Huang L, et al. 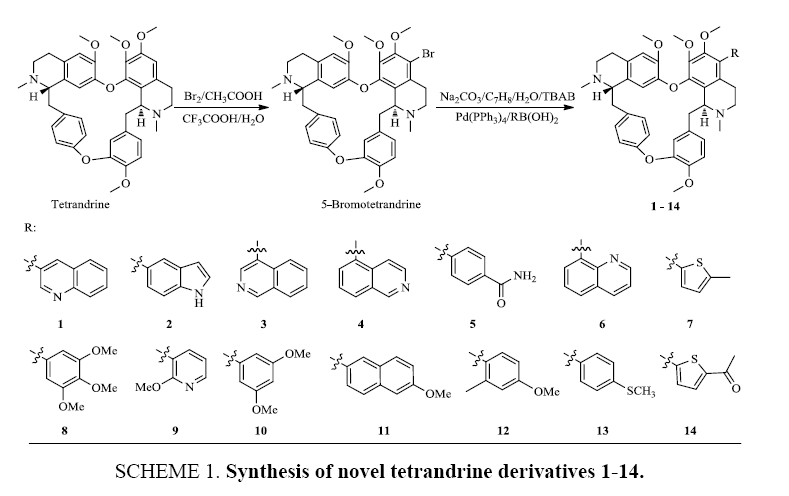 Design and synthesis of novel tetrandrine derivatives as potential antitumor agents against human hepatocellular carcinoma. Eur J Med Chem. 2017;127:554-66. Lei RR, Hu HF, Bai F, et al. Anti-proliferative and apoptotic effects of S1, a tetrandrine derivative, in human gastric cancer BGC-823 cells. Chin J Nat Med. 2016;14(7):0527-33. Xu W, Debeb BG, Lacerda L, et al. Tetrandrine, a compound common in Chinese traditional medicine, preferentially kills breast cancer tumor initiating cells (TICs) in vitro.Cancers (Basel). 2011;3(2): 2274-85. Chen SR, Liu W, Wang K, et al. Tetrandrine inhibits migration and invasion of human renal cell carcinoma by regulating Akt/NF-κB/MMP-9 signaling. PLoS ONE. 2017;12(3): e0173725. Yin HF, Qian XP, Liu BR. Research progress on anti-tumor mechanism of tetrandrine. J Mod Onc. 2011;19(3):582-84. Chen BA, Wang W, Lin GW. Advancement in research on anti-tumor effect of tetrandrine. Journal of Nanjing of TCM University (Natural Science). 2001;17(2): 128-30. Li X, Su B, Liu RM,et al. Tetrandrine induces apoptosis and triggers caspase cascade in human bladder cancer cells. J Surg Res. 2011;166(1): e45-51. LiDC, LiuHZ, LiuYF, et al.Design, synthesis and biological activities of tetrandrine and fangchinoline derivatives as antitumer agents. Bioorg Med ChemLett. 2017;27(3):533-36. Wu JM, Chen Y, Chen JC, et al.Tetrandrine induces apoptosis and growth suppression of colon cancer cells in mice. Cancer Lett. 2010; 287(2):187-95. Cho HS, Chang SH, Chung YS, et al. Synergistic effect of ERK inhibition on tetrandrine-induced apoptosis in A549 human lung carcinoma cells. J Vet Sci. 2009;10(1): 23-28. Wei N, Liu GT, Chen XG, et al. H1, a derivative of Tetrandrine, exerts anti-MDR activity by initiating intrinsic apoptosis pathway and inhibiting the activation of Erk1/2 and Akt1/2. BiochemPharmacol. 2011; 82(11):1593-603. Sun H, Liu XD, Liu Q, et al. Reversal of P-glycoprotein-mediated multidrug resistance by the novel tetrandrine derivative W6.J Asian Nat Prod Res. 2015; 17(6): 638-48. Wei X, Qu TL, Yang YF, et al. Design and synthesis of new tetrandrine derivatives and their antitumor activities. J Asian Nat Prod Res. 2016; 18(10): 966-75.